Same model as the Chamberlain 955D. This LiftMaster model 365LM universal plug-in 1 channel radio receiver kit is ideal for use as a replacement radio control or to upgrade to a more secure system. 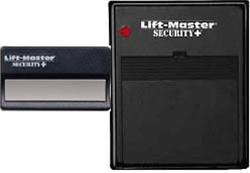 It works with all Lift Master, Chamberlain and Sears remotes that use either dip switches, billion code or security plus technology operating on 315Mhz. Plugs into a standard power outlet and wires to either the remote push button or directly to the garage door opener. Note: Will not work with remotes that operate on 390Mhz. Use the 635LM which operates on 390Mhz. * Activates one garage door opener or gate opener. * Accepts up to 8 Security Plus remote controls or one DIP switch code remote controls. * Can be used as replacement or additional radio receiver for existing doors. * Power: Plugs into standard polarized 120 volt, 60Hz AC outlet. * Frequency: FCC certified 315MHZ. * Codes: Rolling code or DIP switch. * Output: Momentary contact closure rated at 5 Amps. * This item includes: 1 Liftmaster 371LM remote, bell wire, wire clips, installation and programming instructions. * Accepts signal from wireless keypad model 376LM (sold separately).